Hi all, been a while since ive posted in this bit of the forum. 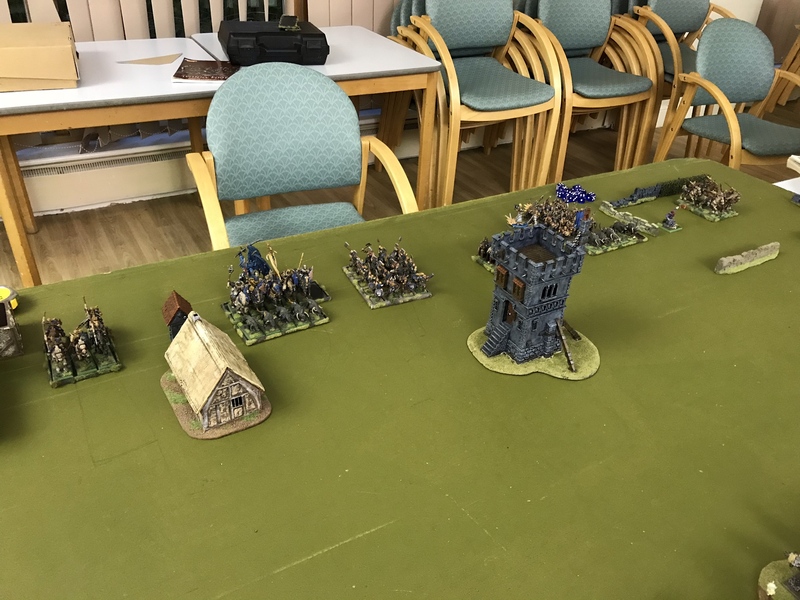 My local games club have started playing 6th ed again with about 20 players involved. This is great news for me as i loved 6th the best. I played loads for games and tournaments during 6th ed and meet lots of the old skool members of this forum then doing so. Ive got my first game tomorrow night so i have been sorting through my old models, which got shipped to the loft with the end times destruction of a last, bad edition of a game i loved. They sre scattered over many boxes, and come caked in layers of dust. I have also had to re learn rules, as best i can in a couple of hours. Hopefully its like muscle memory and itll all come back to me. Ive struggled to get to grips with the stat lines and defence balance. Ive been playing lots of 8th ed 40k since it came out and a lord level character only having three wounds is scary. However, its a different balance from a differnet time, you dont get attacked if you kill everybody touching you. If i remember, its about static combat resolution from deep units and killing from the characters. The good old days of the Village idiot style list, if any of you can remember him. Mounted characters leading massive infantry units with self supporting battalions. Search for it. However, this time round, im using my warriors of chaos army. It in better shape than my empire forces, though ive had to mend quite a few guys stil. Also a much smaller model count. 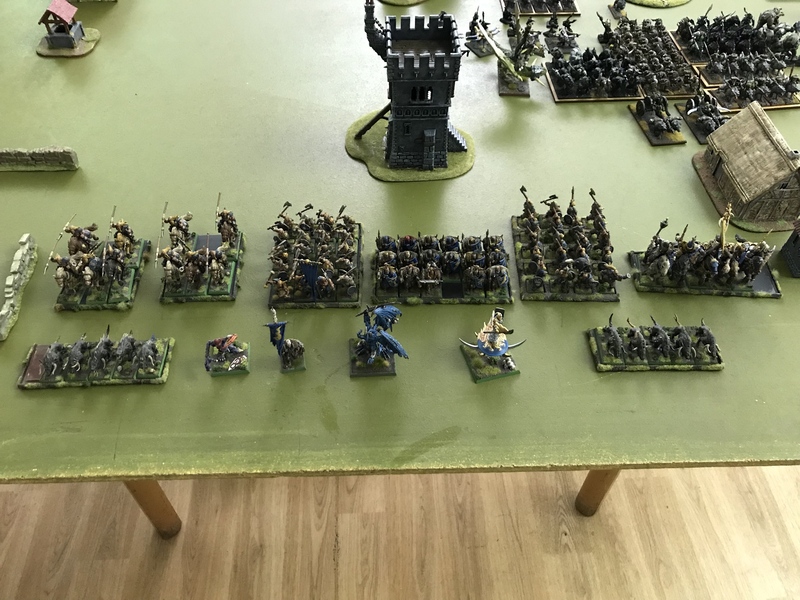 The lord of tzeentch on disc and 18 chosen warriors on foot is very nearly 1000pts, half an army. The hordes of chaos is such a bland book. No monsters at all just warriors, marauders, hounds and spawn. Oh, and daemons if thats your thing. Anyway i promise to get a few pictures tomorrow so you can all reminisce the good old days of 6th, also my list and a quick report. Hopefully this should be a start of a running thread and get me to re construct all my different empire province armies. There are 40 different shades of black, so many fortresses and ways to attack. A little plug though, if you like the TVI style of play, it has become entirely valid in the latest versions of T9A. I'm myself committed to making it work, and better players than me have shown that it can be done. Awesome to think that 20 folks are going to do this! I'd need to relearn the rules before I play any WFB. Oh man the glory days of the TVI lists. I remember those, usually with some twitching. At the time I was playing mostly dwarves, and I got to listen to my usual Empire opponent tell me all about it as he slaughtered my poor, brave Dawi. It was a good strat. Those were in the 6th edition Beasts of Chaos AB. So envious of your chance to re-live 6th edition! Glory years of playing for me. Although IIRC my Countessa's army was 0.500 at best. Still that was fun. 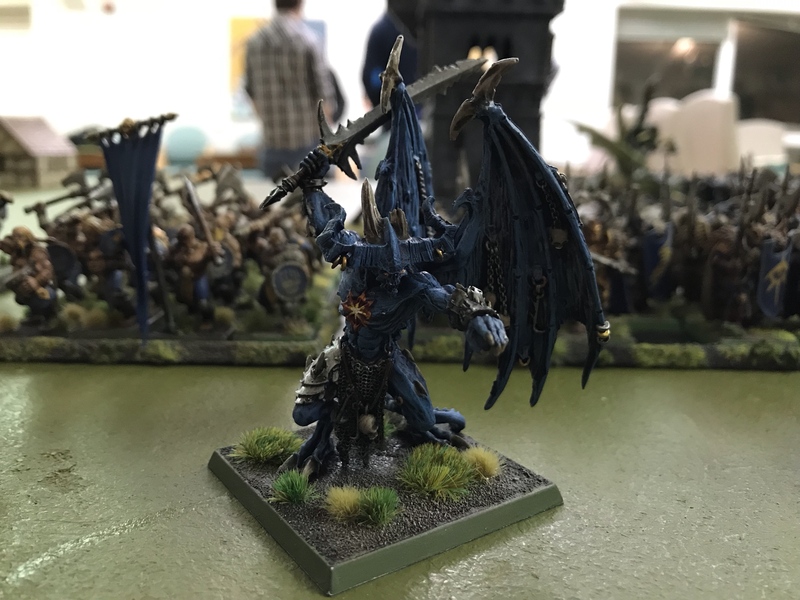 Exalted Daemon - Painted in a 3am late night session the day before, just ilke going to a tournament! Spawn, 5 hounds, 2 x 5 marauder horse with javelins and spears. No animosity or stupidity for orcs and general advance. The bolt throwers were super acurate in the early turns and killed a knight and two marauder horse, who ran off the board. Shamen 'eadbutt'd the knight champion and killed him. 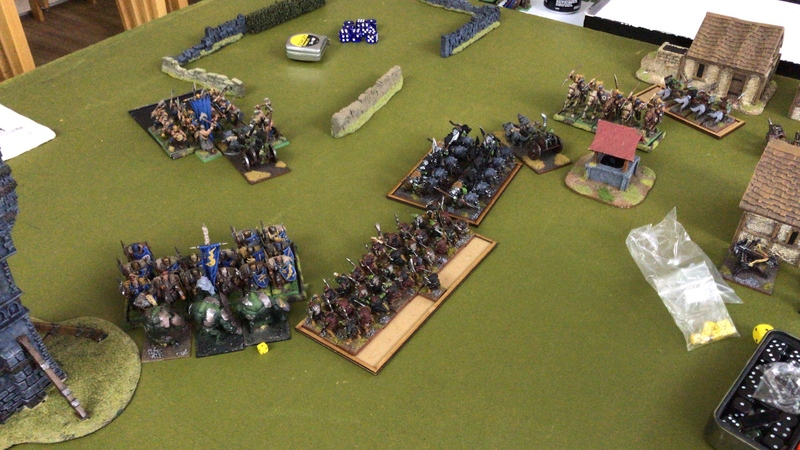 Boar boys fail animosity, but rolled a 6 and move forward then charged spawn along with chariot. 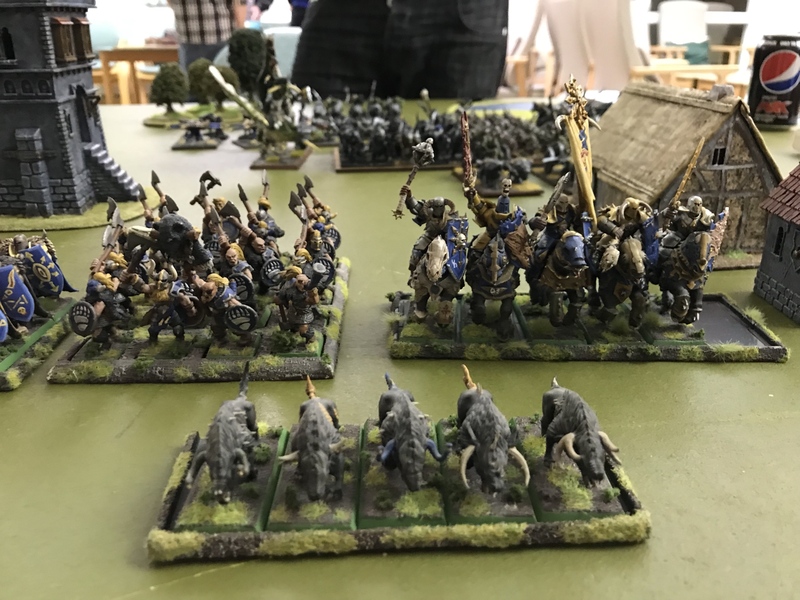 Orc boys unit also failed and squabbled. 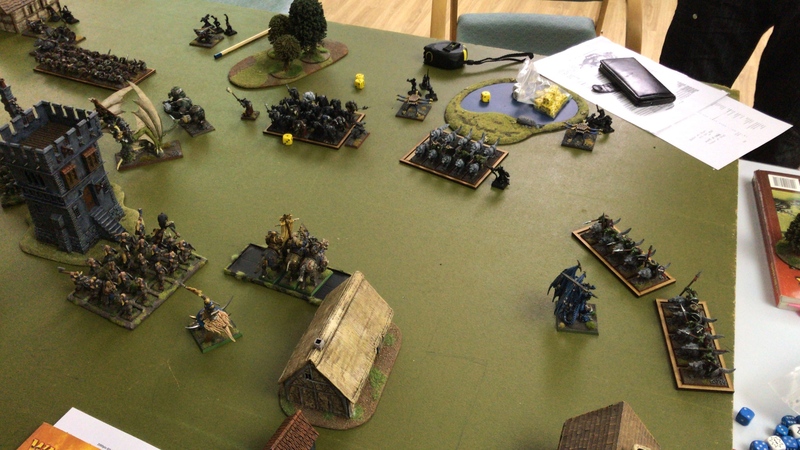 Large wolf riders charged knight and got themselves smashed and ran off a mightly 17", with knights in hot pursuit. Bolt thrower wounded daemo, but rolled a 1 for number of wounds fortunately One unit of wolf riders fled off board with terror, but other held. Turns went quite quickly now so its a bit of a blur to ill summise both halves. The knights killed the last bolt thrower. 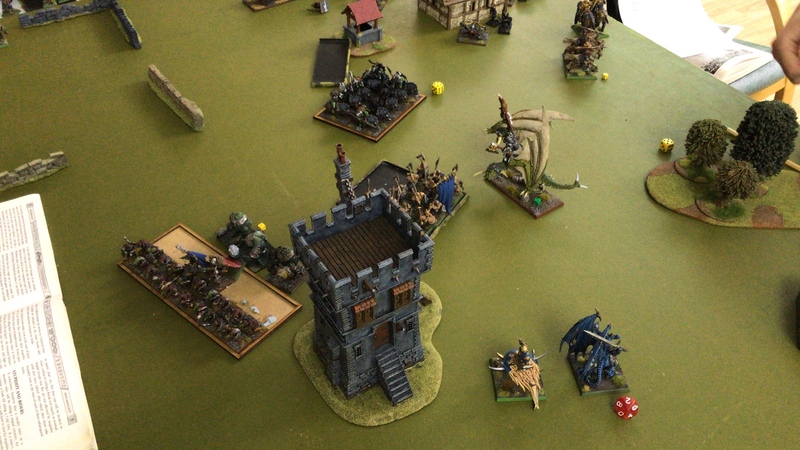 The chariot dies to magic, boar boys lose half their number to a blue fire magic missile and gobbos once again lose 8 to green fire and flee, never to rally. 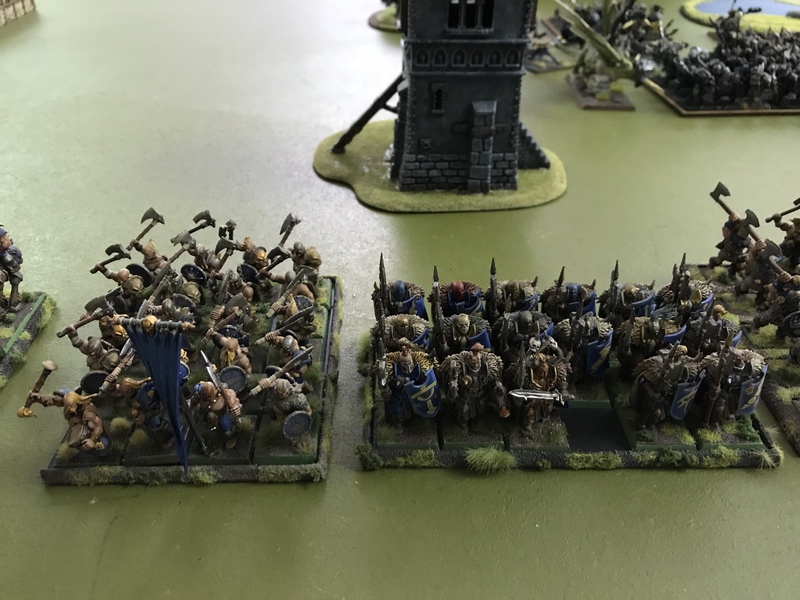 Marauders see off orc unit. Wyvern moves away from my character and tries to scare off knights and remaining marauder horse but they pass. I moved characters to blast boar boys and charoit. I have moved the characters to close to wyvern, and just in his arc and get charged. 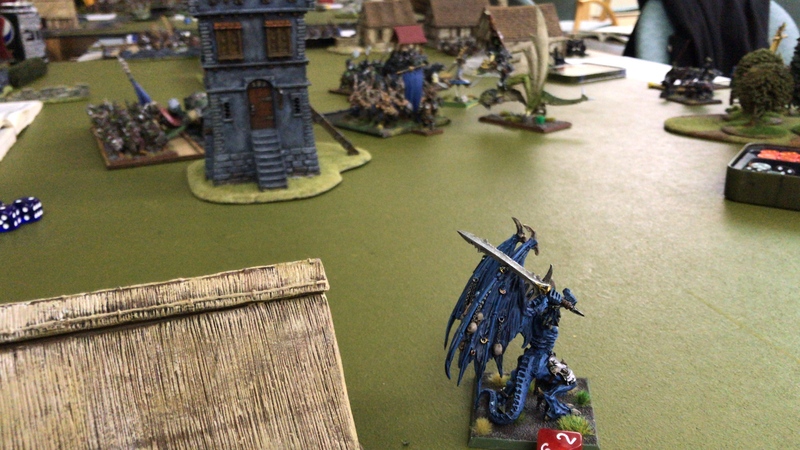 The exalted champion flees but daemon has to take the charge. This will decide the game. However, both side completely fluff attacks and i lose by one to outnumber and pass break test. 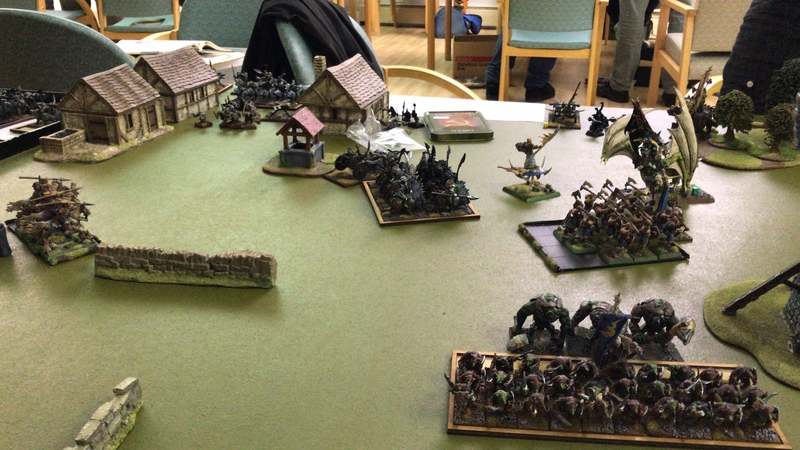 in my turn the exalted champion rallies and marauder horse charge into help daemon but fail to hurt rider as he has a 1+ save. Daemon managed to cast orange fire, which is full re rolls on himself and proceeds to slay the wyvern and general auto flees to a fear causing enemy wrapping up the game. A narrow victory to chaos! 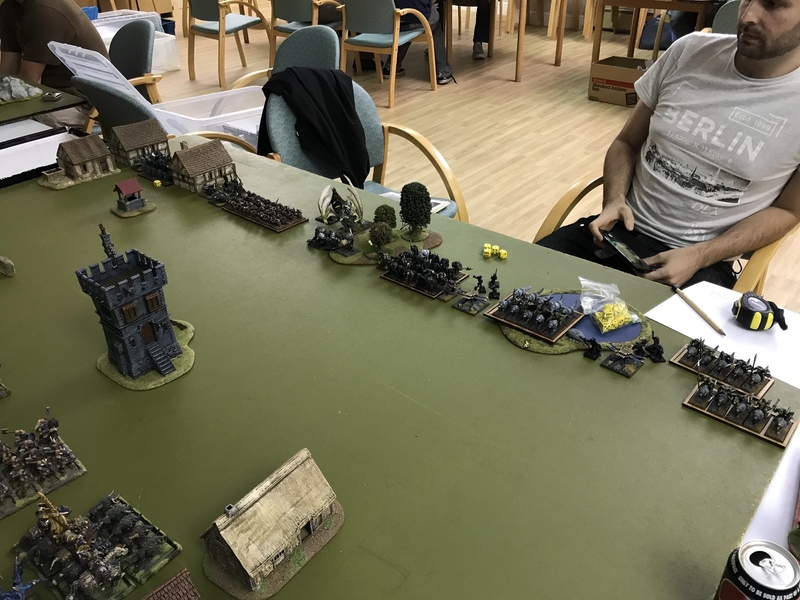 the game was a blast and we had to look up loads of rules, but considering i've not played that rue set for 10+ years it was all still in there and we both had a great time. 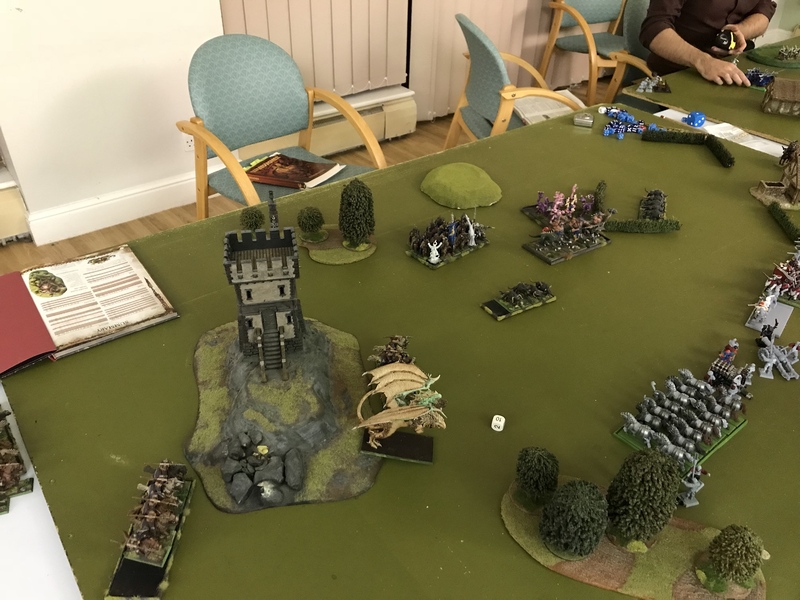 There were two games of 6th on, and a game of 3rd Ed WFB! Next game in two weeks, either going to take my DOW or an Empire force you'll be pleased to know. 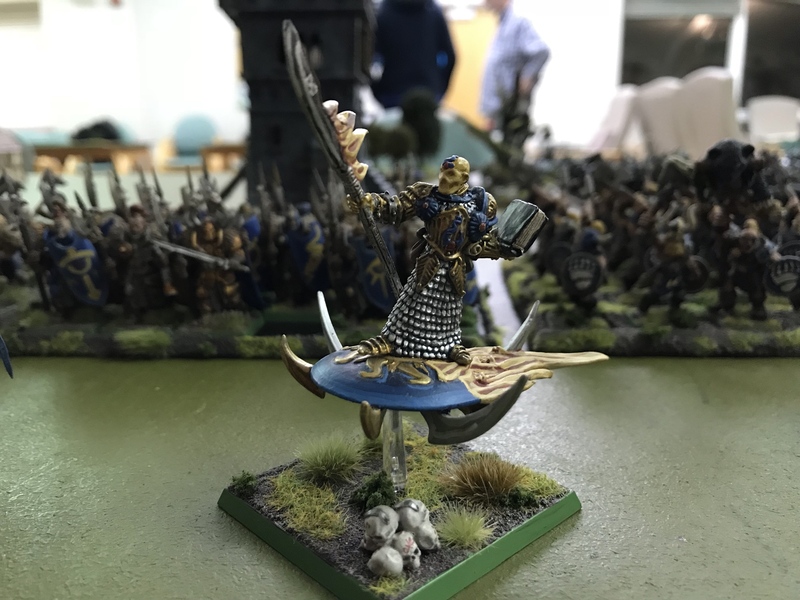 I the mean time i've got a new chaos BSB to paint, after using the unit standard bearer of the warriors as one and his pathetic performance the punishment of the Tzeentch for it. How much fun is that?! I started in 6ed and that felt completely natural. Excellent report. Back then the only BR’s I had to read was in the WD. Did not know of online community at the time. Following this, a blast from the past! Loving this. 6th Edition was the main one I played for years. I think I got into the hobby around 5th edition, but didn't really play games or read rules till 6th started. I still remember glory days of sniping the vampire count general with ballista's and cannons, only for him to rush my army before crumbling away. Let's do this next bash guys. Totally up the it at the next bash! I’m going to use my DOW in the next game, they are really bad in 6th with out a rufus special army list to help them. Another reminder for me to get a frickin' passport. Got another game tomorrow. I’ve been asked to take a chaos list against his Empire. He wants to use his witch hunter he has just painted up. I’ve decided to try a monster mash army. All undivided. I’ll get another report up after the game. Ended up playing tie games last night in 3 hours. My opponent conceded turn three in the first and turn four in second. I only took pictures of first game so I’ll share those. Second game we were just trying to get through. A classic gun line with a big block of knights. He doesn’t move up except pistoliers and swords men with dets on my left. 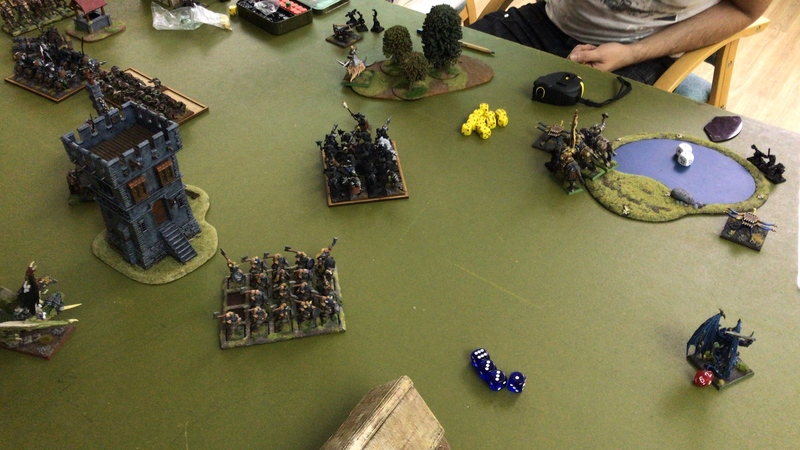 All his wizards are out of range of their spells more or less as I deployed half inch behind line. I set it deployment dice at 11.5” to catch him. 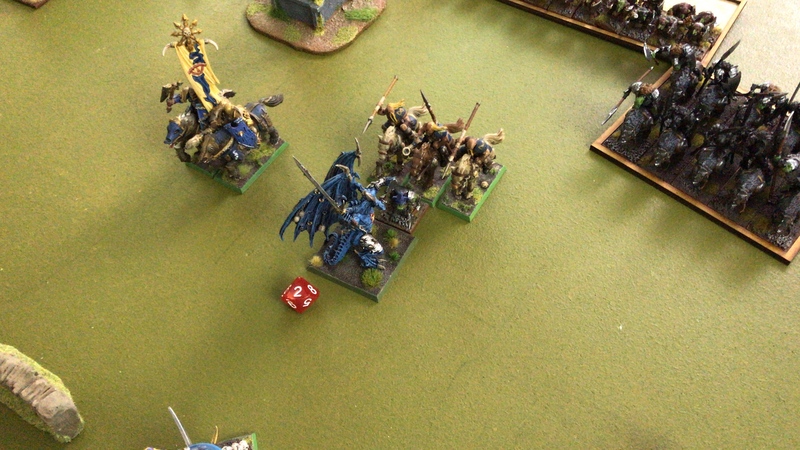 Cannons did three wounds to a dragon ogre, kill a troll but missed chimera due to misfire. 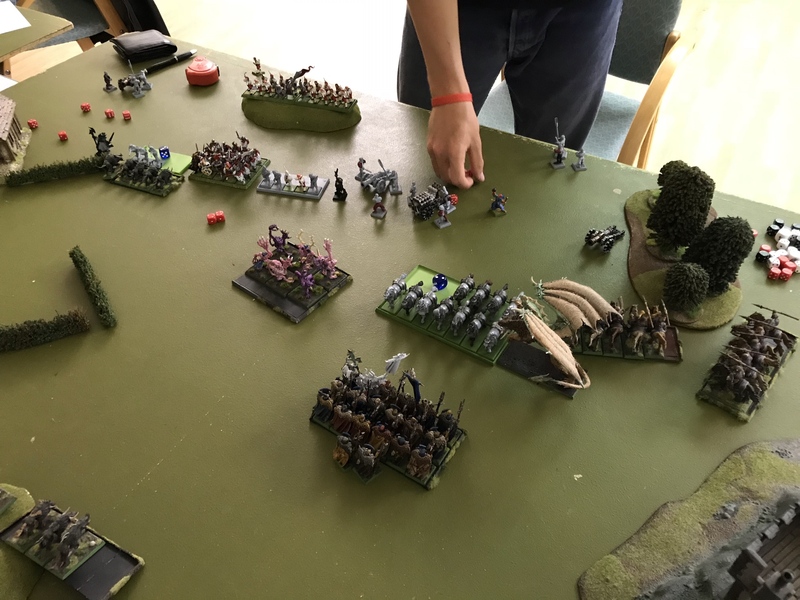 My turn it’s a general advance, marauder horse change pistoliers, two die to Stand and shoot and other three get killed in combat. Not good. They kill two pistoliers. 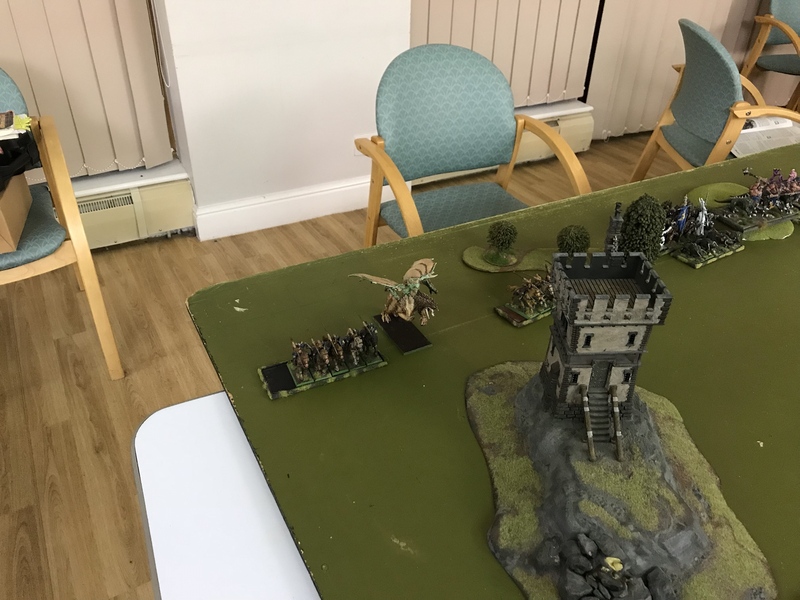 I set up trap with hounds in middle and chimera and horsemen on flank. 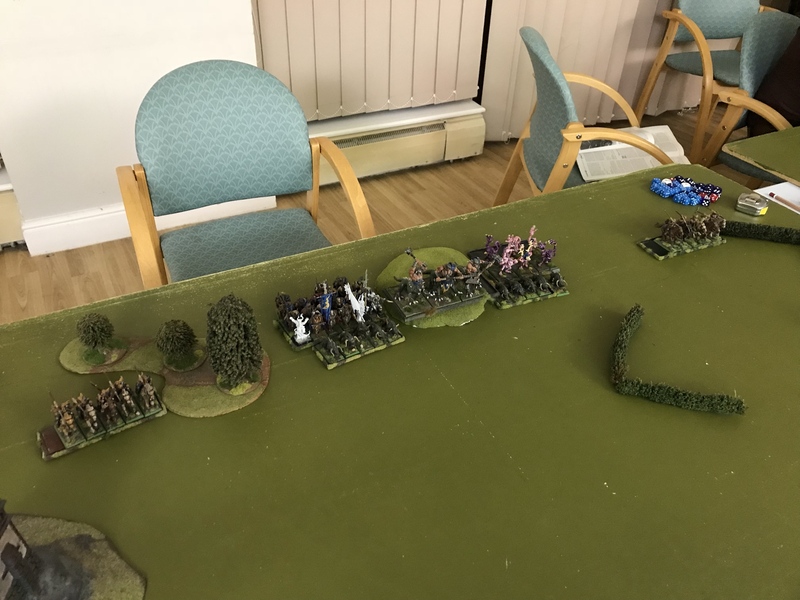 Mortal of the story; 1) don't fall for obvious traps and, 2), even with a gun line army don't remain static and let your opponent dictate the game. As it was only 9pm, we resent the game and played again. 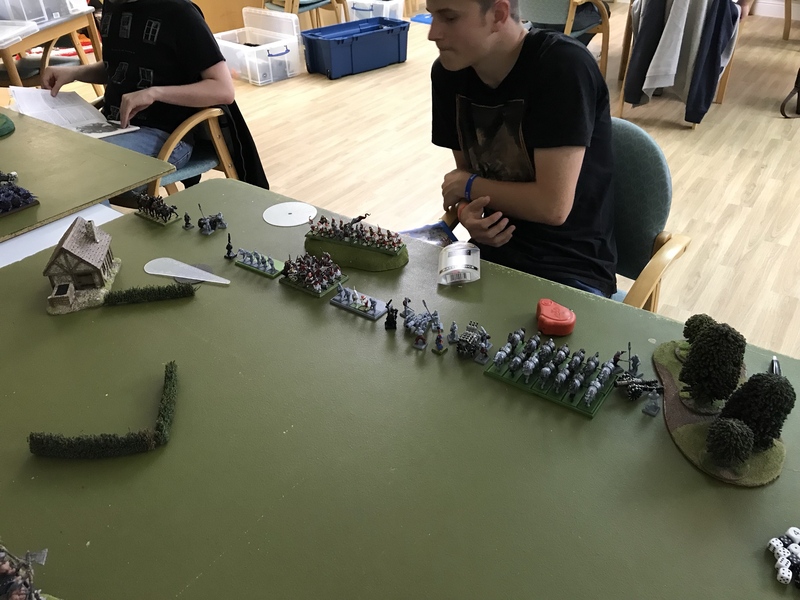 No pictures, ended in a similar way, cahso lord and warriors beat the knights and marauder horse in the flank ran them down. Much closer game though, I lost the trolls, DO and Chimera. HBVG exploded in a pathetic way. As we all know, the empire army need the leadership of the EC or TGM and gun line armies need cheap chaff and Pegasus captains to throw out and slow down the enemy to give all those lovely shooting units a chance. Ah yes, empire gunline armies. Not a great matchup for a chaos list! Still, the small arms fire could actually do something against infantry units in 6th edition, when they were usually between 15-30 strong. 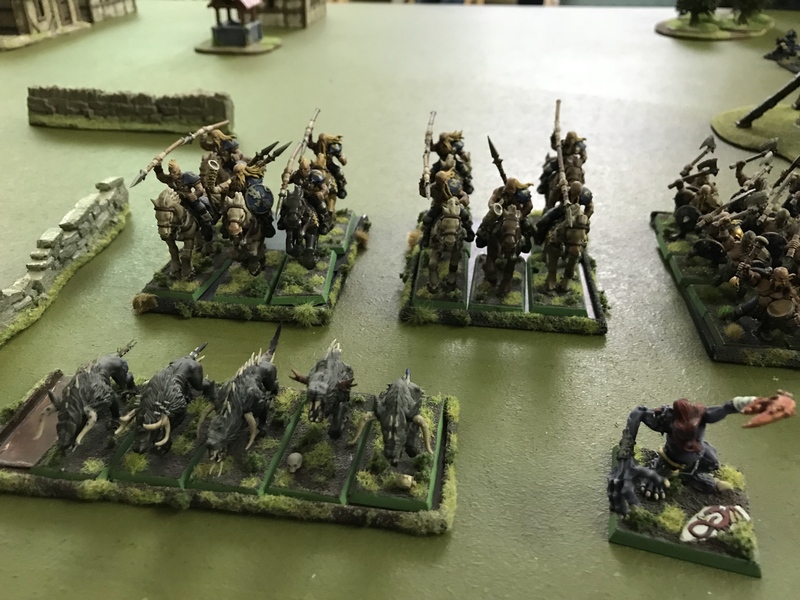 Shooting crossbows at 50 strong 8th edition hordes was largely pointless. 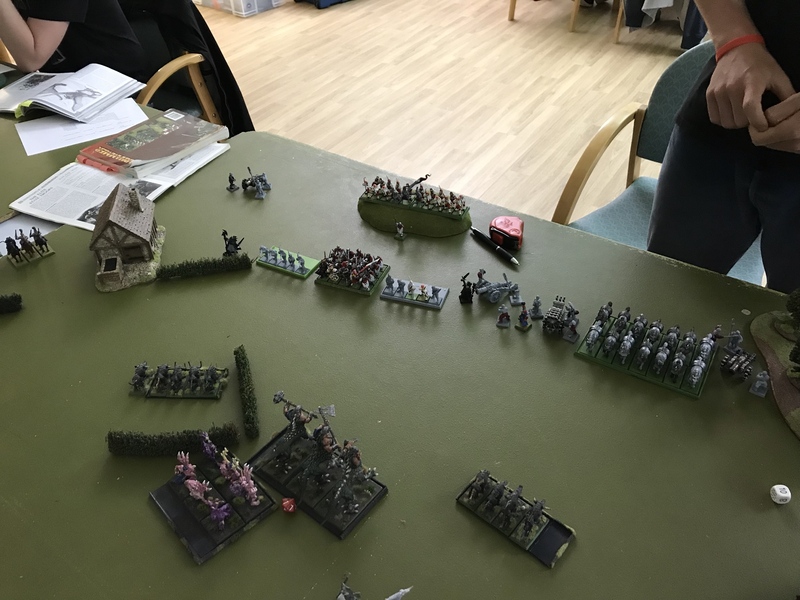 Great to be able to read warhammer battle reports again! Any more games on the horizon? Looking forward to a DOW report, I've always loved that army. Wish they'd got a proper army book in 6th, 7th or 8th. Game planned for every other monday. Playing 40k on the other Mondays . The guys have also started playing on Saturdays as well but i tend to be busy; kids! Ill run the DOW next time. They arent a great army, core units cost to much. The chaos list i took was a little strong i think to the stanard and level of play. I struggle with being too competitive tbh. I struggle with being too competitive tbh.